While the extinct 42-foot, 2,500 pound titanoboa (Titanoboa cerrejonensis) was the largest snake to live, two present-day contenders exist, depending on what you mean by "biggest." The reticulated python (Python reticulatus) is the world's longest snake, whereas the giant anaconda (Eunectes murinus) is the world's heaviest snake. Although the exact size of reticulated pythons vary from snake to snake, with females generally larger than males, the longest snake ever found belonged to this species and measured 32 feet, 9 1/2 inches long. It's extremely common for these snakes to grow in excess of 16 feet and fairly common for them to measure more than 35 feet. On average, they weigh around 250 pounds, but they can weigh up to 350 pounds. Reticulated pythons live in southeast Asia, in areas including Borneo, Burma, the Nicobar Islands, Sulawesi and parts of the Malay archipelago. They only live in tropical environments, where temperatures range between 80 and 92 degrees Fahrenheit. They usually reside in tropical rain forests, where they generally spend time near water sources, such as ponds, streams or small rivers. They can be found in other parts of the world, but only in captivity. Giant -- or green -- anacondas definitely live up to their name, with the average male reaching around 10 feet and the average female measuring roughly 20 feet long. Specimens of up to 30 feet have been recorded, but they still fall short of the top lengths of the reticulated python. They are, however, heavier than any other snake species, weighing a maximum of 550 pounds. 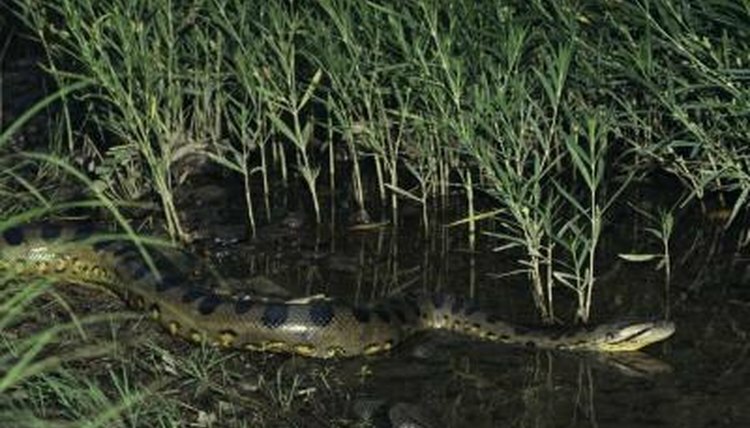 As a semi-aquatic species, giant anacondas tend to live in or around shallow and slow-moving freshwater areas, such as floodplains, streams and ponds. These South American creatures are most commonly seen in the Amazon basin area in Brazil, the Orinoco basin in Colombia and the flooded Llanos grasslands in Venezuela. They're also native to countries such as Trinidad, Peru, Ecuador, Paraguay, Suriname and Guyana. A small amount of these snakes live in the wild in Florida, but they were introduced, rather than being a native species.